$100,000 Guaranteed Prize Fund will not be reduced! 9 Rounds Open, All Other Sections 7 Rounds with 3 Schedules! The NATIONAL OPEN is one of America’s longest running premier Open tournaments. No tournament in U.S. history was handled with more regard for the comfort and convenience of the players than the first National Open and we are proud to continue the tradition of this National Championship. First established by Ed Edmondson in 1965, Fred Gruenberg brought the tournament back to Las Vegas in 1983. He and Alan Losoff organized the National Open for over 25 years and added to its well-deserved reputation as The Chess Vacation of the Year. 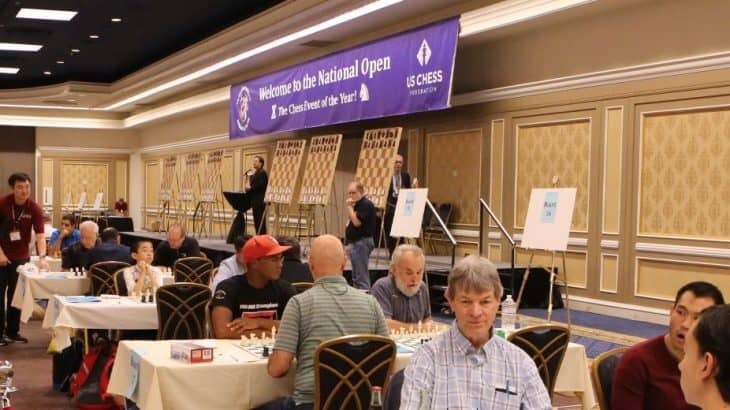 Over the years, with additional championships and events, the National Open has grown to become the centerpiece of the Las Vegas International Chess Festival. Alan and Janelle Losoff have organized the tournament since Fred retired in 2009, but he continues to support the tournament as a player and with the “Freddie” awards for promising players under the age of 15. The National Open is a 7 round (9 rounds for the Open Section) Swiss System tournament, and you can choose between the standard 4-day or alternate 3-day or 2-day playing schedules. Half-point byes are available for all rounds, with proper notice to the Tournament Directors or with your advance entry. The Open, Under 2300 and Under 2100 Sections will be FIDE rated. Chess sets and boards are provided for tournament play only, not for skittles. Live broadcasts of select games from the National Open, and other events will be available here and on some of our sponsor web sites. Thank you to our many loyal players who keep coming back year after year, for the Chess Event of the Year!